It might seem a bit early to be thinking about Christmas, but Advent will be here before we know it, along with all the hustle and bustle that goes along with that time of year. 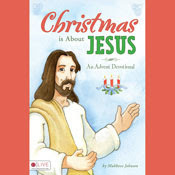 “Christmas is About Jesus” is a lovely little book that will help children (and their parents) focus on the true meaning of Christmas. Each day from December 1st through the 24th features a Scripture verse and a reflection on a symbol of Christmas and how that symbol reminds us of Jesus. Some of the symbols covered include snowflakes, candy canes, ornaments, St. Nicholas, Christmas trees, Christmas lights, cookies, songs, and stars. As the days get closer to Christmas, the devotions focus on those who were at the first Christmas – the wise men, shepherds, Mary, and the most important one of all, Jesus. The book is attractively designed and easy to use. It could be used at home or as part of a religious education class. The reflections could be used alone or combined with a craft for a longer lesson. “Christmas is About Jesus” will help keep minds focused on Jesus during the Advent season. Can you remember the excitement of being a child waiting for Christmas? The days of December seemed to drag on forever. There were Christmas pageants to prepare for and activities at school to fill the days. Letters to Santa had to be written. Anticipation built daily with dreams of what presents might be under the tree. The boxes on the Advent calendar were oh so slowly opened! Finally, the magical day arrived. As adults, the anticipation is not always so great. We often approach the holidays with a little bit of dread. There is so much to be done – decorations to be hung, presents to be bought, meals to be prepared, wrapping to be completed, obligatory parties to attend, out-of-town guests to welcome into our homes, Christmas pageants to make costumes for, and the list goes on. It is exhausting even to think about! As women, the task of making the holidays merry seems to fall to us. Sometimes, the only waiting for Christmas we take part in is waiting for it to be over so that life can return to some degree of normal in January. Yet the Advent period, the four weeks preceding Christmas, is meant to be a time of holy waiting. The word “Advent” comes from the Latin “adventus” which means “coming.” It has been set aside as a time for interior preparation for Christmas since the sixth century. The first Advent took place in the hearts of Mary and Joseph, and all the Jewish people who longed for a Messiah. The original Advent involved waiting for a child to be born. One cannot rush a child’s birth, nor would one want to. It takes a full nine months to create a healthy baby. As much as a pregnant woman may want her pregnancy to be over after six or seven months, she knows that it takes that full term for God’s creative work to be done within her. In Advent, we both celebrate the coming of the Christ child all those years ago, and anticipate the second coming of Christ at the end of time. We are still waiting. Amidst all the hustle and bustle, it is perhaps unrealistic to expect Advent to afford the same opportunity for reflection and personal self-improvement that the corresponding season of Lent does. It is appropriate, however, during this time of “holy waiting” in the Church year, to acknowledge the spiritual value of waiting. Life does not always unfold on our terms but on God’s. We pray and sometimes wait years for answers. In those times of our lives, we are engaged in “advents” of our own. We wait for a change in circumstances, for love to come, for a child to be born, for our creative spirit to spring forth, for any number of realities to emerge. Ultimately, we wait for death and the opportunity to be reunited with God. Waiting, although often difficult, has the potential for transformation within us. Holy waiting has a value all its own. If Christmas just appeared any day that a child wished for it, the day would soon lose its value. The fact that it comes only once a year makes the event all the more special. The waiting can indeed be pleasant and filled with good things as well. As we embrace our own “advents,” may we reclaim some of that youthful enthusiasm of the child within us and hold dear to the gracious gifts God provides. I still believe in Santa Claus, not the whole North Pole concept complete with Rudolph of course, but the idea of Santa Claus as the spirit of giving. There have been times in my life when presents have just appeared anonymously in unlikely places. These gifts from secret Santa Clauses have often been the most special. I know some people feel children shouldn’t be allowed to believe in Santa Claus. In fact, my parents fell into that camp. From the earliest ages, I knew that my presents came from my parents and that Santa Claus was just a story. My mother did tell me not to tell other kids, though, so I wouldn’t ruin the fun for them. With my own young children, I have tried to maintain more of a balance. They know about St. Nicholas and that he is the real Santa Claus. They know about the spirit of giving and that we all help Santa Claus by making and buying gifts for other people. They definitely know that Christmas is about Jesus. We spend Advent getting ready for Jesus’ birth. This year we are doing a Jesse Tree and reading daily from a little book of reflections on Advent for children every day. They will participate in the Christmas Eve pageant at Church as they have the past three years. Secure in that knowledge, I don’t feel bad that they still believe in Santa Claus and Rudolph. Their classmates still believe as well. In fact, at one point, I actually tried to tell them that Santa Claus as depicted in the popular media isn’t real. I was rebuffed by a very strong, “Santa is real, Mommy!” After all, you can actually watch Santa’s travels on the NORAD website! The secular trappings of the Christmas season are magical to children. While Jesus’ birth should certainly be magical enough, the music on the radio, the beautiful tree (mostly covered with ornaments that they have made), the lights, making Christmas cookies, and dreaming of the presents that will be under the tree Christmas morning all add to their celebration of the season and bring joy into our cold, dark New England days. Truth be told, they help me enjoy the season as well. I believe it is possible to balance the sacred and the secular during this time of preparation for Jesus’ birth. The spiritual aspects are of paramount importance, but the other aspects are enjoyable as well. A child can believe in Santa and still understand that the reason we are getting the presents is to help celebrate Jesus’ birth. I love the figurine of Santa bending in prayer over the Baby Jesus in the Manger because I think that it illustrates this concept so well. Even Santa (and especially the real Santa, St. Nicholas) knows the reason for Christmas. As adults we can spend ample time in spiritual preparation while still enjoying Christmas parties and gift giving. If we allow the secular traditions to enhance our celebration of the spiritual, then there is no conflict. It is only when we allow the secular to take precedence over Jesus that we run into difficulty. John still speaks to us today, and perhaps we are an even more stubborn audience than the one he faced 2000 years ago. After all, we have heard this message of John the Baptist year after year. We know that Jesus came and we celebrate it every year with all of our favorite Christmas traditions. We pray, we light the Advent wreath, we sing “O Come All Ye Faithful” and “Hark the Herald Angels Sing” and “Silent Night.” This is all well and good; but, do we change? Or do we breathe a sigh of relief when December 26th comes, thinking “Thank God that is over for another year!” and go back to our pre-advent ways? It can be difficult to focus on the spiritual aspects of advent. Lent seems so much more conducive to prayer and fasting and sacrifice. The month of December requires much from most of us. There are celebrations to attend, children’s pageants to get ready for, presents to buy, decorations to put up, and cards to send. The “things to do” list seems to take on epic proportions. The question of “are you ready?” prompts a mental overview of the tasks that still need to be done before Christmas arrives, rather than a reflection on our inner preparation. Yes, John is shaking his head at us as well. “Don’t you get it? He’s coming. Time is growing short. You need to get ready. Now!” John doesn’t care about the state of our Christmas decorations. I imagine Jesus doesn’t care much, either. They don’t care about our famous Christmas fudge or how many presents are under the tree. They do care, however, about the state of our souls. Most of us don’t live in constant anticipation of the end of time, the way the first generation Christians did, but for each of us individually, the end is near. We never know when death may come to us. We may live one more day or eighty more years, but in either case, life is short. The time given to us is short. Each year, in this season of advent, John the Baptist comes back to remind us, his voice shouting out to us to get ready, to repent, to change our ways. Today. Here are some traditions you may want to incorporate into your family or practice on your own as a means of keeping the focus of Christmas on the birth of Christ. An advent calendar is a way of marking the days until Christmas. There are many commercially made which often have small doors to be opened each night of December 1 – 24 revealing a message or part of a picture. An inexpensive variation on this would be to have a picture of the nativity (a religious calendar picture or large Christmas card could work), cut it up into 24 puzzle pieces and put one piece on the puzzle each day. An advent wreath is a simple circle of greens with four candles – three purple and one pink. One candle is lit the first week of advent, two the second, three the third, and all four the final week. The purple candles represent our need for self-examination and reconciliation with God as we prepare for Christmas. The pink candle is lighted the third week of advent and represents the joy of Christmas. There may also be a large white candle in the middle of the wreath which is lighted Christmas Eve and Christmas day and represents Christ coming into the world. 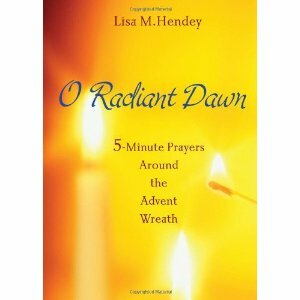 A simple advent wreath lighting service might contain a reading from Scripture or a Christmas hymn. In the middle ages, the Germanic peoples began incorporating a lighted wreath into the Christian season of Advent. It didn’t gain widespread popularity until the 1800s and it wasn’t until the 1900s that German immigrants brought the tradition to America. The Advent Wreath is very symbolic. The evergreens used for the wreath itself are a reminder of continuous life. The shaping of them into a circle reinforces that meaning. The circle is also a sign of everlasting life as well as the eternity of God. The four candles used, three purple and one pink, mark the Sundays of Advent before Christmas. The purple candles are reminders that this should be a time of prayer and sacrifice to prepare us for the second coming of Christ. On the third Sunday, the pink candle is lit to announce Gaudete Sunday, a Sunday of rejoicing for Christ is coming near. With the lighting of that candle, the light has won out over the darkness (three candles lit vs. the one that remains unlit). Various meanings have been assigned to the four candles. One interpretation has each candle representing 4000 years, the Biblical time between Adam and Eve and the coming of Christ. In another interpretation, the first candle represents the patriarchs, the second the prophets, the third reminds us of John the Baptist, and the fourth of Mary, the mother of Jesus. They have also been described as the prophets’ candle, the Bethlehem Candle, the shepherds’ candle, and the angels’ candle. A fifth white candle in the center representing Christ can also be used. It is lit on Christmas Eve as a remembrance of Christ coming into the world. Sometimes, all the other candles of the wreath are removed and replaced with white candles on Christmas. The Advent Wreath serves as a powerful visual reminder of the holiness of the season. The light of the candles invite us to quiet ourselves during this busy time and reflect on the true meaning of Christmas. Whether at home or at Church, it provides an invitation to wait and pray in hopeful anticipation for the coming of Christ. We are called to welcome the light of Christ into our lives.